President Yoweri Museveni personally visited the scene where the former Buyende District Police Commander (DPC), Muhammad Kirumira who was gunned down by unknown assailants. The assailants shot Kirumira together with unidentified woman he was driving with in his Toyota Corona vehicle number UAJ 228V on Saturday night at around 8:00pm in Bulenga, Wakiso District along Kampala-Mityana Road. According residents, the gunmen who were riding on a motorcycle fired about ten bullets in the vehicle before speeding off. Following the shooting, President Museveni personally dashed to the crime scene. 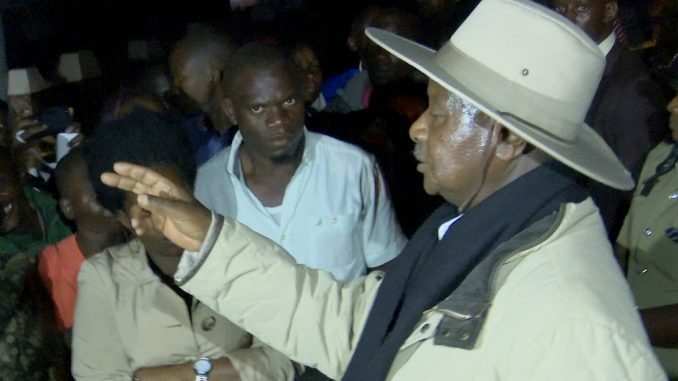 Museveni who arrived at the scene at around 11:50pm dressed in a cream jacket and his trademark hat signaled to residents who were watching from a safe distance to converge. He asked those who witnessed the shooting to volunteer information. Unidentified youth stood up from the crowd and followed by a boda boda rider. 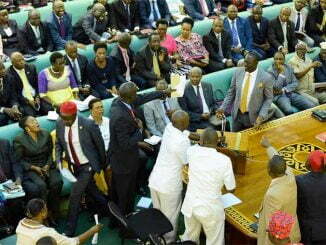 Museveni started interrogating them on what they had seen. He took almost five minutes speaking to the duo. At this time, Museveni who looked perturbed ordered journalists to switch off their gadgets. Those who persisted were roughed up by the President’s security that arrived at the scene armed to the teeth. As the president was engaging the eyewitnesses, several youths could be overheard shouting “Bosco, Bosco” while others kept shouting “embeera mbi” meaning the situation is bad, claiming the killers were in government. President Museveni took both eyewitnesses with him as they were seen boarding one of the vehicles in the presidential motorcade. The President later comforted resident of the area on the loss of Kirumira. “Ngabitalo, mwebale nnyo mwebale nnyo tujja kudda,” the president said as he waved to the crowd. Eyewitness accounts show that the assassins came riding a red sport numberless motorcycle. The assassins who were dressed in black apparently monitored Kirumira’s movements until they got him in their target. Kirumira is the second high profile assassination victim this year. The other is the former Arua Municipality Member of Parliament, Ibrahim Abiriga who was gunned down together his sibling Saidi Buga Butele while returning home in Kawanda in Wakiso district in June this year. They join a long list of other people gunned down by motorcycle riding assassins. 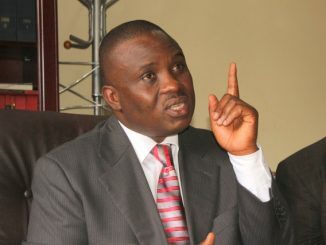 These include the former Police Spokesperson, Andrew Felix Kaweesi, Senior Principal State Attorney, Joan Kagezi and Sheikh Maj. Mohammed Kiggundu, Dr. Abdulqadir Muwaya, the former top Shia cleric in Uganda, Hassan Kirya, the former Kibuli Spokesperson, Mustafa Bahiga, the former Kampala District Amir, Sheikh Abdulqadir Ssentamu, a reknown Muslim preacher and Sheikh Abdulrashid Wafula, the former Dawah Secretary of Bugisu Muslim District and Imam Bilal Mosque in Mbale town. Although Police has arrested a number of suspects in connection to the said murders, up to now none has been convicted. While addressing parliament shortly after Abiriga’s assassination, president, Museveni listed eleven security measures to curb the assassinations and crime in the country. The measures included but were not limited to finger printing all guns, which would enable forensic analysts identify the firearm that discharged bullets at a particular time, regulation of social media, installation of street cameras in all towns and on major highways, ensuring that all cyclists obtain illuminated numbered helmets with electronic number plates which would enable government to know which vehicle or motorcycle was in a particular area at the time the crime was committed and banning of hoods among others. The president also ordered the revival of the police 999 service and reinforcing the Police Flying Squad with Unmanned Aerial Vehicles – UAVs also known as drones. To date it is unclear, which of the measures have fully been implemented. Kirumira shooting comes as the president is expected to address the country on security related matters later this evening. The former District Police commander (DPC) Buyende Muhammad Kirumira and a woman he was sited in the car with were confirmed dead at Lubaga Hospital. The two were rushed to the Hospital at around 10pm, an hour after they were gunned down by unknown gunmen in Bulenga. 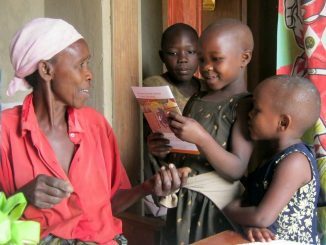 One of the police officers who responded to the scene told this publication that by the time they arrived, the woman who residents had earlier identified as Kirumira’s wife was still breathing but succumbed to the bullet wounds on the way to the Hospital. The police spokesperson Emilian Kayima confirmed that the two were pronounced dead at Lubaga Hospital where there bodies are still kept. 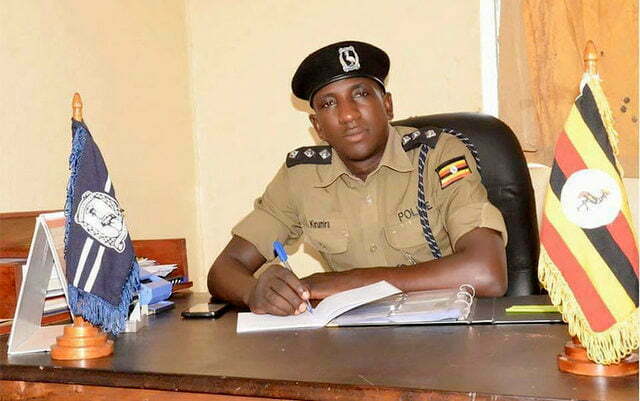 “The Uganda Police Force is greatly concerned with the assassination of ASP Muhammad Kirumira at Bulenga near his home at around 9:00pm. He was with a lady residents confirmed to be his wife. She too succumbed to bullet wounds and was pronounced dead on arrival at Rubaga Hospital this evening,” Kayima said in a statement released about two and a half hours after the shooting. Scene of crimes officers are still analysing the place where the shooting occurred and have since sealed it off. At the time of his assassination, Kirumira was sited in his personal vehicle, a Toyota Corona registration number UAJ 228V together with the woman. The vehicle was parked on the road side.